COLOMBO: THE trigger was supposedly a road-rage incident, said to have involved members of Sri Lanka’s Muslim minority, near the popular tourist destination of Kandy. A lorry driver from the country’s biggest ethnic group, the Sinhalese, ended up dead. Angry Sinhalese mobs, urged on by Buddhist monks, began attacking mosques and businesses owned by Muslims, hurling rocks, burning tyres and setting fires, leading to at least two more deaths. In response Maithripala Sirisena, the president, declared an island-wide state of emergency on March 6th. The emergency, which grants wide powers to the police and army, is preventive in nature and intended to reassure vulnerable groups, an aide to the president said. On March 7th authorities restricted access to social media to prevent the spreading of rumours and fomenting of further violence. Rajitha Senaratne, a cabinet spokesman, said the attacks had been organised, with many of the perpetrators bused in from other areas. He hinted that supporters of Mahinda Rajapaksa, a former president under whom Sinhala-Muslim clashes at Aluthgama in 2014 left several dead, were to blame. Mr Rajapaksa, who relies strongly on Sinhalese nationalist backing, has enjoyed a recent resurgence in popularity. A new party he founded won 239 out of 340 contests at local elections on February 10th. In comments to media, he denied that the violence was part of a political conspiracy and blamed the government’s failure to respond to social tensions. 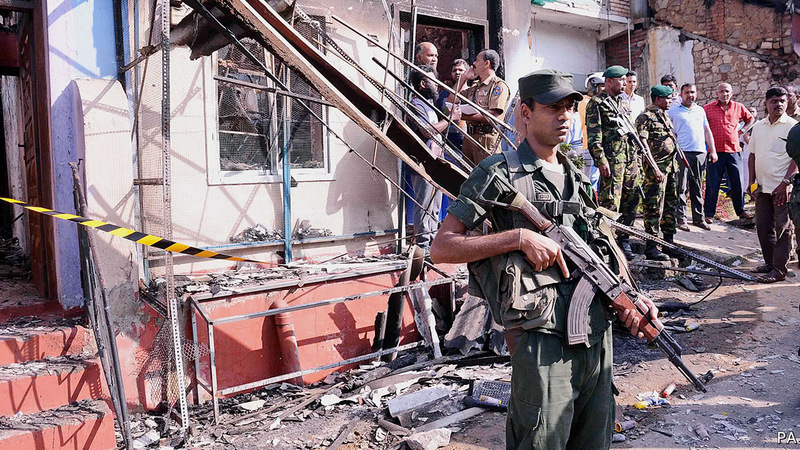 It is the second time in as many weeks that violence has flared between Muslims and Sinhalese. On February 26th mobs rampaged in Ampara on the east coast after a video of a Muslim restaurant-worker confessing to adding “sterility pills” to food sold to Sinhalese women went viral. Muslims make up close to 10% of the population, with a high concentration in Kandy and the east. Sinhalese Buddhists account for 70%. The mostly Hindu Tamils constitute around 13%. The biggest faultline in Sri Lankan society remains between Sinhalese and Tamils. In 2009 the Sri Lankan army ended 26 years of war by defeating the Liberation Tigers of Tamil Eelam, who were fighting for an independent Tamil homeland in response to claimed discrimination by the Sinhalese. There is some mistrust between Sinhalese and Muslims too: many Sinhalese believe, wrongly, that the slightly higher birth rate among Muslims poses a threat to the continued demographic supremacy of the Sinhalese. But throughout the civil war Muslims and Sinhalese mostly coexisted peacefully. Posted March 15th, 2018 .